If there one new style velvet collar overcoat you want to buy this season that has the style and commitment to class, this Chesterfield black wool overcoat by Falcone is it. 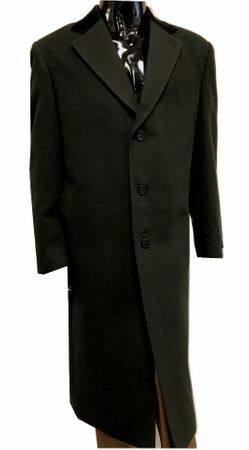 This Falcone Black Chesterfield with Velvet Collar Wool Blended Overcoat features a full length 48 inch length with french faced linings,single breasted and looks fantastic. Fabric is Wool Touch Poly/Rayon/Wool Blend. If receiving compliments is something that lights up your day giving you a feeling that you're floating on air, you will more than definitely received them by the boatload when you wear this Double breasted style Velvet Collar Overcoat. This is one of those sharp looking overcoats that will simply show the world that you know how to dress like a sophisticated man and appreciate the finer things in life. Since the color of this coat is black with Black velvet you'll be able to wear it with half the suits you own in your closet without giving second though to it.